1.4.3 How to download the BSSC Inter Level Admit Card 2018? आप में से बहुत से लोगों ने Bihar SSC Inter Level Exam के लिए फॉर्म भरा था और अभी तक इसके एग्जाम को होने का इन्तजार कर रहे हैं. वैसे तो आपको पता ही होगा कि Bihar SSC Inter Level Exam का एक बार एग्जाम हो चूका है जिसमे कुछ ही शिफ्ट की परीक्षा हुई थी और उसके बाद इस पुरे परीक्षा को रद्द कर दिया गया था क्योंकि इसमें काफी ज्यादा भ्रष्टाचार हो रहा था. तो अब जो है बिहार एसएससी नए नोटिफिकेशन जारी कर लोगों को ये बताना चाह रहा है कि अब Bihar SSC Inter Level Exam कब होगा और कब से इसका एडमिट कार्ड जारी कर दिया जायेगा. इसी से संबंधित जानकारी आप सभी को निचे प्रोविडे कराइ गई है. The recruitment process for BSSC Inter Level posts started in 2014 and the preliminary examinations were conducted in 2016. However, the papers were leaked and the examination was subsequently cancelled. As per the information, the BSSC is now taking effective measures to ensure that the examination can be conducted in a secure manner. As per the report published in ‘Hindustan’, the centre lists for all the centres, barring Gaya have been shared with the DM. As per the letter, the examination would be conducted in two shifts on all the three days. 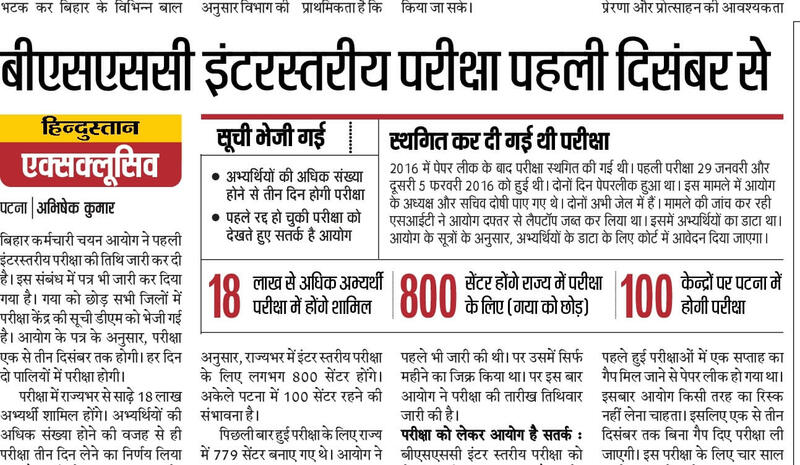 Reportedly, about 18 lakh candidates are expected to appear for the examination. Bihar SSC 12th Level Exam Admit Card 2017 2018 Bihar Staff Selection Commission BSSC Inter Level Exam 2014 Combined Competitive Exam Admit Card Hall Ticket Call Letter 2014 2018. BSSC Whatspp Group 2018– एग्जाम की तारीख पहले 1 जून 2018 को निर्धारित की गई थी किन्तु इसमे अब बदलाव कर दिया हैं और एग्जाम का डेट डेट को अभी फिक्स नही किया गया हैं जैसे कोई जानकारी आती हैं हम आपको अपडेट करेंगे ! आपको तो पता ही है कि बिहार एसएससी पहले कोई सुचना जारी करता है और फिर उससे मुकर जाता है. इस बार फिर से ऐसा ही हुआ और फिर से Bihar SSC Inter Level Exam में देरी हो रही. ऐसे में आप सभी को सिर्फ एक चीज काम आएगी वो है धैर्य. आप धैर्य बनाये रखिये और इस साईट और YOUTUBE चैनल से जुड़े रहिये. आपको Bihar SSC Inter Level Exam की सबसे पहली जानकारी इसी पर दी जाएगी. हम प्रतिदिन इस कोशिश में लगे हुए हैं कि आपके लिए कोई अच्छी सी न्यूज़ लेकर आयें जो Bihar SSC Inter Level Exam से संबंधित हो. Final Verdict: Interested candidates in the Bihar SSC State Level Combined Competitive Exam can keep in touch with our website for all latest updates on exam date and admit card. We will update this page from time to time with the latest news. Email: [email protected] or Call on 0612-2227728. Candidates can share their doubts and queries on the BSSC Admit Card 2018 Bihar Inter Level Exam Date through the comment form. Our team will try to solve your queries. pages, keep it up, thanks..